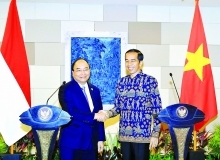 (VEN) - Prime Minister Nguyen Xuan Phuc paid an official visit to Indonesia earlier this month, stepping up the high-level contacts of the past year between the two Asian states. At important meetings, Vietnamese and Indonesian leaders agreed on the need to turn economic cooperation into a linchpin of the relationship between their countries. In August 2017, Vietnam Communist Party General Secretary Nguyen Phu Trong visited Indonesia. Last month, Indonesian President Widodo paid an official visit to Vietnam, marking five years of the bilateral strategic partnership between the two sides. “I believe that the Vietnamese-Indonesian strategic partnership will continue to develop more deeply for the benefit of the two nations and for peace and prosperity,” Prime Minister Phuc told his Indonesian hosts. In recent years, bilateral trade has grown steadily to hit US$4.6 billion in 2012, US$5.6 billion in 2016, more than US$6.5 billion in 2017 and US$4.7 billion in the first seven months of 2018. It is expected to amount to US$10 billion by 2020. Vietnam’s exports mainly include rice, crude oil, cement, electronic components, and agricultural products, while Indonesia’s exports include fertilizers, petroleum, packaging, equipment and machinery, fabric, paper and confectionery. Vietnamese Ambassador to Indonesia Pham Vinh Quang said Indonesia is in need of Vietnamese farm produce. If food hygiene and safety barriers are removed, the bilateral trade in farm produce will increase, he said. Specific measures will be taken by the two sides to increase bilateral trade to US$10 billion, including facilitating commodity exports that are strengths of each country, reduction of technical barriers, simplification of customs procedures, and close cooperation in origin control and quarantine inspection. In addition, the two countries will create business-to-business and enterprise-to-government dialogue forums to solve problems arising in the process of investment and doing business. President Joko Widodo said he told the Indonesian Ministry of Industry to address issues related to the import of Vietnamese televisions and mobile phones. Leaders of the two sides agreed to review the 1990 Agreement on Economic, Trade and Technical Cooperation and consider making the Joint Committee on Economic, Scientific and Technical Cooperation (JTEC) an important policy tool to promote economic cooperation. The leaders also agreed to expand cooperation in such new areas as digital economy, intellectual property, new technology, clean energy, smart urban areas, information technology (IT), smart agriculture, logistics, and startup development, aiming to take advantage of opportunities provided by the Fourth Industrial Revolution or Industry 4.0. Indonesian President Joko Widodo expressed his wish for Indonesian entrepreneurs to be more active in finding business opportunities in the potential market of Vietnam, especially in the fields of pharmaceuticals and medical instruments. Indonesian investors focus mainly on oil and gas exploration and exploitation, coal mining, banking, hotels, wood refining and export, and fiber and garment manufacturing in Vietnam. Some large Indonesian projects in Vietnam include the US$2.1 billion Ciputra Hanoi International City and the US$66 million Pullman Hanoi Hotel in Hanoi - the capital. Indonesian investors are building an international standard hospital in Hanoi. As of June 2018, Indonesia ranked fifth among ASEAN (the Association of Southeast Asian Nations) countries and 30th among 126 countries and territories worldwide investing in Vietnam, with 71 projects totaling US$514 million in capital. Vietnamese enterprises have 13 investment projects in Indonesia with a total capital of US$54.7 million in the fields of oil and gas and mining. Vietnam attracted about 70,000 Indonesian visitors per year, while Indonesia welcomed some 50,000 Vietnamese visitors annually. The two countries should promote cooperation in tourism development, as they both have the potential of ancient cultures and picturesque landscapes. Vietnamese Ambassador to Indonesia Pham Vinh Quang said Vietnam is experienced in hydropower development and can send its workers to Indonesia for large projects in this field, he said. The two sides agreed to hold negotiations on special economic zones and strengthen cooperation in illegal fishing prevention. They also agreed to continue building and developing cooperation within the Indo-Pacific region, with priority given to promoting the leading role of ASEAN. The leaders agreed upon early establishment of a marine cooperation agency to facilitate cooperation in scientific research, marine environmental protection, fisheries development, sustainable aquaculture and fishermen protection, and at the same time strengthen cooperation in agriculture, human resource development and tourism, and consider direct flights between the two countries.